When I got back to work after lunch today, there was a beautiful pink flower in an elegant white teacup sitting on my desk. Well, I love flowers. And I do love surprises. So the surprise flower was a big hit. It really made my day (of course it doesn't take much to make my day a little happier). Upon further study, looking around the room, I realized all the girls in the office had the same little sursy. After asking around, it became apparent that the gift was from one of our bosses, Rick. Please accept the peony and the teacup I have placed on your desk. It is tradition for Bousquet gentlemen, in spring to give the (non-family) women ‘about’ them, fresh cut peonies from their garden in a teapot or teacup. According to the tradition (and Feng Shui); For the Mademoiselles, the flower shall bring romance. For the Madame, the flower shall bring happiness. (This falls under the phase-if Mama ain’t happy, nobody’s happy). It is a big year for my family, as my peony bush (the youngest) has produced enough buds for me to carry on the tradition. It was only yesterday that a another bud appeared, to make the count….I wanted/needed 18! 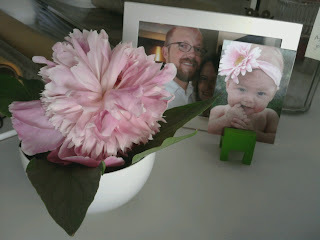 These flowers are from an antique peony bush that has been in my family for many generations. It has been in Charleston for eight years. My Great Grandmother brought it to America (NY) from France the year my grandmother was born. Next week is my grandmother’s 95th birthday. Just thought I'd share... too cool of a story to let pass by!